Jerwin Ancajas retained his junior bantamweight world title for the second time as he impressively knocked out mandatory challenger Teiru Kinoshita with a right hook to the body in the seventh round on Saturday night at Suncorp Stadium in Brisbane, Australia, where it was Sunday afternoon. Fighting in the co-feature of Manny Pacquiao's welterweight world title defense against Jeff Horn, Ancajas (27-1-1, 18 KOs), 25, of the Philippines, made his mentor proud. He is the first world titleholder promoted by Pacquiao's MP Promotions, and he made it look easy against Kinoshita (25-2-1, 8 KOs). After a slow opening round, Ancajas picked up the pace and took control in the second round, when he opened a cut over Kinoshita's right eye. With blood dripping into Kinoshita's eye, referee Ignatius Missailidis called a timeout to have the ringside doctor take a look at the wound. As Ancajas worked the body and took it to Kinoshita, blood streamed down his face from the cut as the fight wore on. Blood aside, the eye also began to swell and was nearly closed by the sixth round in an increasingly one-sided fight. In the seventh round, Ancajas, a southpaw like Kinoshita, unloaded a picture-perfect right hook to the body and Kinoshita went down to his knees. He beat the count, but he was in no condition to continue, and Missailidis waved off the fight at 1 minute, 53 seconds. "I was happy with the result though the early ending was an unexpected bonus," Ancajas said through a translator. "It was not an easy fight. My opponent was strong. I am comfortable at this weight and would like to make a few more title defenses." Ancajas did most of his damage with body shots. According to CompuBox punch statistics, he landed 120 of 335 punches (36 percent), 50 of the landed blows to the body. He landed more body punches than Kinoshita landed total punches -- 46 of 248 (19 percent). Ancajas won the belt by unanimous decision from McJoe Arroyo last September and defended it by seventh-round knockout of Jose Alfredo Rodriguez on Jan. 29 before wiping out Kinoshita, 31, of Japan, who came into the fight having won six bouts in a row since losing a unanimous decision to South Africa's Zolani Tete challenging for the same 115-pound belt in 2014. Featherweight prospect Michael Conlan (3-0, 3 KOs), the popular Irish Olympic star, easily stopped Brisbane's Jarrett Owen (5-4-3, 2 KOs) in the third round of their scheduled six-round bout. All three of Conlan's victories have come by third-round KO. As expected, Conlan, 25, outclassed Owen, 31, from start to finish. In the third round, Conlan hurt Owen with a left hand to the body, which was the beginning of the end. He unloaded about 10 unanswered punches, including some fierce right hands to the head, at one point looking to the ref as if to ask him to stop the fight before he really hurt Owen. After Conlan landed a few more shots, referee Tony Kettlewell stepped in to wave it off at 1 minute, 56 seconds, just as Owen's corner was throwing in the towel. "It was my best performance as a professional. I feel great about that," said Conlan, who moved to Southern California to train and focus on his career. "I was disciplined and focused on executing the game plan. It took me two rounds to find my range, and then I was able to settle in and break him down. The body shots were hurting him. I'm so honored to support my country. I want just to make them proud. I'm looking to return to the ring in September. Thank you, Brisbane. You have put on a brilliant event." Conlan, who claimed an Olympic bronze medal in 2012 but was controversially eliminated before the medal round in 2016, made his heavily hyped pro debut on March 17 -- St. Patrick's Day -- at the sold-out Theater at Madison Square Garden in New York, where his pal Conor McGregor, the UFC superstar, walked him to the ring. 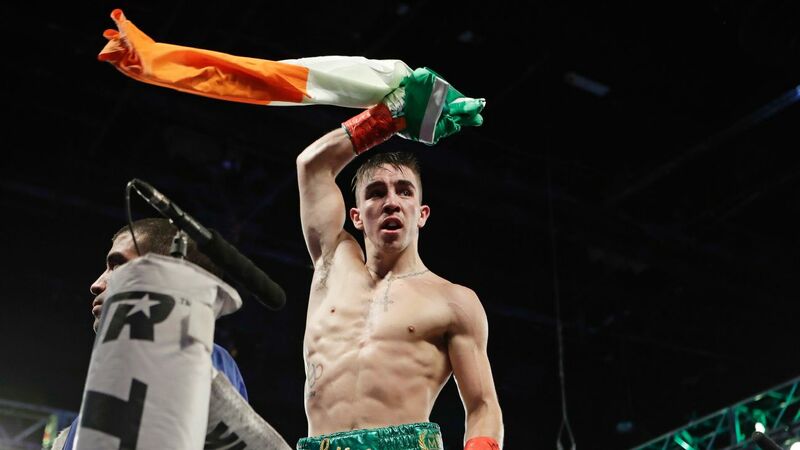 Conlan smoked Tim Ibarra in a third-round knockout victory and won his second fight on May 26 in Chicago, knocking out Alfredo Chanez, also in the third-round, to set up his appearance in Brisbane. Top Rank was anxious to put Conlan on the Pacquiao-Horn card because Brisbane has a large Irish community, including many members of Conlan's extended family who moved there seven years ago. Australia's David Toussaint (11-0, 8 KOs) outboxed and outpunched Shane Mosley Jr. (10-2, 7 KOs) to win a well-deserved split decision in a middleweight fight. It was an entertaining fight, but Toussaint had the clear edge and won 77-76 on two scorecards while one judge had it 77-75 for Mosley, which appeared to be a stretch. "This was a huge opportunity for me," Toussaint said. "It was a great fight, and take nothing away from Shane Mosley. I can't wait to get back into the ring. Just keep lining them up." Toussaint, a southpaw, took it to Mosley from the outset and hit his stationary foe with a lot of left hands. Mosley, 26, of Pomona, California, opened a small cut over Toussaint's left eye in the second round, but it had little impact. Mosley, the son of former three-division world champion Shane Mosley, usually has been trained by his father but was not for this fight. Trying to break out on his own, Shane Mosley Jr. asked his father to stay home and was trained by Eric Brown instead. Mosley thought he deserved the decision. "I walked him down. I walked down a power puncher. I was landing the straight right all day," Mosley said. "I could tell he was getting tired. He chose to box instead of fight the last two rounds. I won that fight."